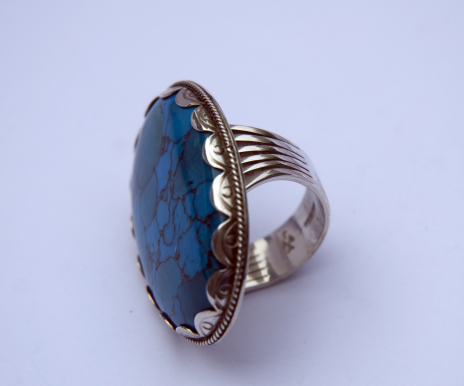 Prices are indicative and depend on ring sizes, the current price of natural turquoise, and the actual currency rates. This unusual six-prong silver-and-turquoise ring, which is rich in symbolism, honors the sacred waters of the NORTH AMERICAN GREAT LAKES and the legendary 600-years lasting, eastward migration that eventually led the Anishinaabe Peoples to their vast borders. For six centuries or more, the Great Lakes have been the home of the Gichi Gami Anishinaabeg (the Ojibwe Peoples of the Great Lakes), who descend from the great Algonkin Nation of the Eastern seaboard. Because the lakes and adjacent rivers and streams in the Great Lakes territory are rich in fish, these waters have been bountiful sources of food for the Gichi Gami Anishinaabeg ever since. However, the lakes’ immense stretches of water are not only a source of food; they are also a MANIDOO (spirit), a sacred source of many life forms. Therefore, whenever a person or a group of persons pass a remarkable or dangerous place on the Great Lakes, one is supposed to say a prayer, accompanied sometimes with a gift of asemaa (tobacco). Always place tobacco in nibi, the water, whenever crossing a lake! Go to my blog story to read more about the ring and the subject of nibi.